Madaline Healey was a 2012 scholar who went on to an AVID volunteer position with our mentoring efforts under Prof Lester Burgess in Laos, and is now working on an ACIAR project. She explained in a recent RAID blog (shown below), how attending our conference helped with her career choice. I remember as a 17-year-old telling all my high school friends that I was heading off to university to study agriculture. “Agriculture! You mean you want to study to be a farmer?” That response was something that I would endure through my entire undergraduate years. Agriculture is a big part of my life. I grew up on a broadacre property in central Victoria. I knew how important agriculture was and also how difficult it could be. I chose to study agriculture because I wanted to help. I wanted to help farmers produce more, both economically and sustainably. My first job out of university was working for the Queensland Department of Primary Industries (as it was known at the time) as an entomologist in their horticulture plant protection team. It involved researching biological control options using good bugs to get rid of bad bugs in vegetables. A few years down the track, a colleague sent me an application for the Crawford Fund young scholar program, to attend the annual parliamentary conference. I remember thinking “if anything, there will at least be some decent morning tea, I mean it’s at Parliament House”. As it turned out, it was the turning point in my quest to figure out what I wanted to do when I grew up. The Crawford Conference is where I realised that I wanted a career in international agriculture. I knew that this was my thing, that this is what my skill set was for. The only snag: how was I supposed to actually get my foot in the door? Cue the Crawford Fund seminar of young scientist’s experiences volunteering in international agriculture, a few months after the conference. At the end of this seminar, the organizer announced that there was a volunteer position with Scope Global, supported by Crawford Fund, in Laos. This was my ticket. 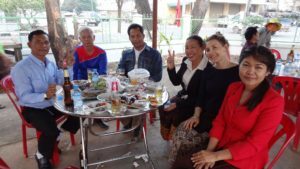 For six months, I lived in Savannakhet, a dusty, French-provincial town on the banks of the Mekong River, working with the Provincial Agriculture and Forestry Office (PAFO) as an Entomology Officer. This role was part of a long-term commitment to increasing production in southern Lao PDR by building capacity in pest diagnostics and IPM. I was so enthusiastic, so keen. I had all these great ideas of what the team and I would do and what we would achieve. First day at work, I was locked out of the laboratory. Seems there was a meeting on and everyone forgot to tell me. No problem. Day two: locked out again. This was a blessing. It made me realise that all of the preconceived ideas I had about my role would not work here. From that point on I went in with no assumptions. I left it all behind and went in with an open mind. My colleagues and I worked on building capacity in insect diagnostics, curating insect collections and building pest checklists for vegetables in the local area. We monitored pest and beneficial insects on local co-op farms and developed pest guides in Pasa Lao (local language) for growers. We developed and facilitated an insect diagnostic and IPM train-the-trainer workshop for crop protectionists and extension officers from provincial and district offices. We used pressure cookers as autoclaves, torches as microscope lights and battled daily with geckos that continued to eat our insect collections. We worked alongside growers to manage pests and were rewarded with countless lunches and impromptu karaoke sessions. And man we did a good job, an excellent job in fact. We became all round crop protectionists, a little bit of entomology, a little bit of plant pathology, and a little bit horticulturalist all rolled into one. I still volunteer time to the Crawford Fund, working alongside my mentor and pal Professor Lester Burgess to continue our work in southern Laos. Our next big project is to build a glasshouse in Savannakhet, to raise healthy pest- and disease-free seedlings, and use it as a training centre for local horticulturalists. 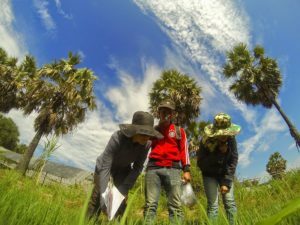 In my job with the University of the Sunshine Coast, I am also working on an ACIAR project, which regularly takes me to Laos, Cambodia, Vietnam and Thailand. I get to work alongside some of the most incredible people and help contribute to rural economic development of the smallholder farm sector through enhanced control of insect pests in the long term. So in response to the many people who said “Agriculture! You want to be a farmer?” No, I just want to give farmers a helping hand.